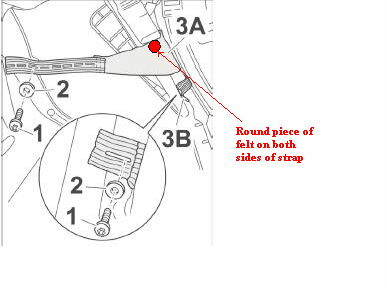 The beginning for this thread talks about this problem occuring when the top is up - has anyone also heard the click with the top down - is the strap even under tension with the top down? I have been chasing an intermittent click from the same area on the driver's side, with the top both up and down, for the last year with my dealer ('07 987S). Nothing the dealer has tried worked for more than a week. Having just now read this thread, I plan to try your remedy. I rarely hear squeaks or noises with the top down but periodically I do hear a click that seems to come from behind me on the drivers side. I hear with or without the wind screens in or out. There so much stuff back there with the top down I have no idea what it could be but it is very infrequent. As to the clicking noise with the top up in cold weather it returned about a month after I sprayed the area mentioned above. Haven't been driving it now since its winter but the spray seemed to do the trick and that is how the dealer eliminated the issue on the passenger side. It doesn't seem to occur with bumps but rather with some combination of body flex on the right side of the car. I never hear it on the highway. The dealer is happy to sort through it but doesn't have much luck in duplicating it. One source of noises with the top down is the little rubber bumpers that protrude from the back of the roll bar on either side. The top rubs against them. A little lubricant solves that problem. I have a similar noise that has been getting worse, have tried putting silicone on lots of different parts to no avail, I notice that if I undo the roof locking handle the noise goes away regardless of how rough the road is. Does anyone have complete diagrams of all the moving parts in the softop?. Porsche tell me there is a fix for the cracking noise, a new felt part for the roof, I should have it installed next week will post how it goes. Let us know. Mine's gotten worse and the lubricant fix does nothing at this point. I plan to take it into the dealer but they can never figure it out so a fix from Porsche would be nice. New to the forum but interested to know that other Boxster drovers have experienced the same problem. I had mine checked by Porsche West London this week and they lubricated the plastic seals around the top of the windows. This has improved things but not got rid of the problem completely. I would be interested to know who in Porsche told you that a fix was available. If someone comes across info on the official fix, do post up as i'd be interrested to see how they solved it. I notice that if I undo the roof locking handle the noise goes away regardless of how rough the road is. This particular problem I solved by lubricating the latch mechanism. I had this same issue and simply stuck a round piece of felt to both sides of the strap in the location shown in red. It seemed to do the trick and my noise was really bad. I've had my hardtop on all winter so had forgotten about this. Today after a few weeks of putting up with the annoying clicks and squeaks coming from the roof I decided to investigate further. I smeared silicone grease on the parts shown in the picture posted earlier in this thread, on both sides. I also greased the rubber/plastic joints where the side frame folds. Hi guys, I've been having this problem since pretty much day one. Took delivery in January 2008. Mine makes the clicking noise on the left side of the car and recently it's been getting bad. It used to be intermittent but it's pretty much clicking all the time now. On rainy days when the roof was wet, the noise disappeared. 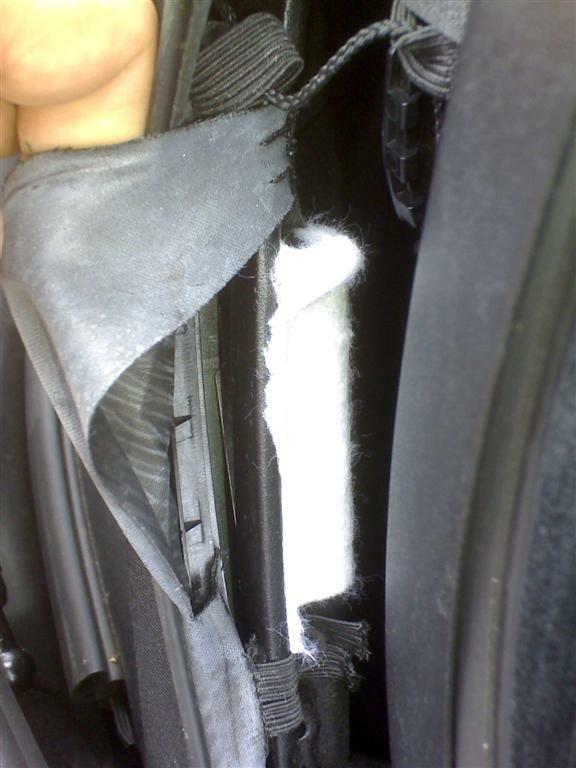 Just had a look at my roof in the service position after reading this thread and noticed that my 2007 S comes with the felt piece stuck to the brace. The piece of triangular fabric in question also looks quite worn. I smeared some super lube on both sides of the fabric and onto the felt sticker. Wish I could go out for a test drive now but my fog lights are fogged up and have been removed for drying. Edit: Ok, as with the other places I've tried to lube, after a couple of miles the noise slowly but surely makes its appearance again. Gonna get a can of silicone lube spray and give it another go. Ok. Lube and felt didn't work for me. Today I covered up that triangular fabric piece with duct tape and the silence was unbelievable. Even drove with the top up in good weather with the radio off to enjoy the silence. Ok. Lube and felt didn't work for me. Today I covered up that triangular fabric piece with duct tape and the silence was unbelievable. Even drove with the top down in good weather with the radio off to enjoy the silence. Hello, thank you very much for all the great information! Beeferino, can we trouble you to post pics and instructions on how to make this fix? I just simply followed the diagrams supplied by Popolou and dschulenberg. 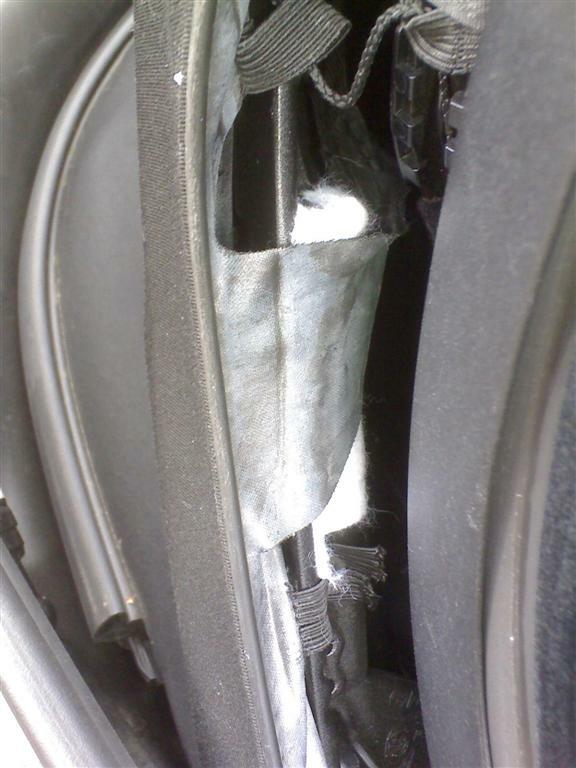 Instead of putting lubricant or a felt pad sticker (my car came fitted with a felt sticker on the part of the roof frame touching the rubbery fabric piece), I wrapped duct tape round the rubbery fabric piece. it's a little tricky maneuvering the duct tape in there with 1 side sticky, and without taking apart the whole fabric roof. Maybe you can try sticking the tape on some wax paper first, getting it in, then pulling the paper out when you are ready for final application. I've attached some pictures where I'm pointing to the offending fabric piece and the duct tape can be seen. In the second picture, I'm pulling the roof off the B pillar slightly so more of the fix is exposed. Hope you solve the problem. It almost drove me mad trying to figure out what it is and rectifying it. Had the dealer try to fix the sound when I took the car in again for its annual checkup and it seems to be fixed. They lubricated everything in the top but also cut out a small portion of the wide grey strap (3A) shown in the photos in this thread where it was frayed a bit on the edge closest to the front of the car. The left side closest to the bump in dschulenbergs post. On the driver side where the noise was the most frequent it even showed signs of being folded or compressed on itself on this edge. It's the same spot where the felt pads were placed by dschulenberg. It's been quiet ever since. From all of the fixes in this thread the noise seems to be related to this strap (3A) getting caught on the protrusion in the metal frame it is attached to resulting in something clicking in the top. With this small amount cut out it is quiet as can be for now. The dealer couldn't replicate the sound and showed no interest in the notes from Seddy that I gave them: "Install special order parts on top Bow; Reqork Bow adjust fit of top, adjust frame to body fit. Part 987-561-927-00 F-kit felt strip" The dealer lubricated before without cutting the strap but the noise always came back so I'm keeping my fingers crossed. Interesting solution of cutting out a portion of that piece. I grew impatient waiting for a free slot for it to be looked at at the dealer's. And for these noise issues, they would go down all possible avenues, which would prob necessitate a few trips. And since I tried the solution myself, I don't want to risk cutting anything out. Maybe sticking a strip of duct tape on that edge of the rubbery fabric piece would have the same effect as a felt sticker. By closest to the front of the car, you mean the upper edge when the roof is in the service position? On a related note, I cracked the B pillar gasket while trying to lube the area where it contacted the frame. It still is watertight but I want to get it replaced. Anyone have an idea of taking those 2 torx T15 screws that hold it in place at the bottom of the B pillar? The rest of the frame is held in by 5 or 6 T15 screws which are easy to get out, but the bottom 2 seem to require some dismantling of the door gasket or the use of an angled torx driver. If you look at the picture on the prior page it was frayed exactly where the red felt pads were placed. That's were a small part was cut out by the dealer. Install special order parts on top Bow; Rework Bow adjust fit of top, adjust frame to body fit. Part 987-561-927-00 F-kit felt strip. I have no problems with the top since this was done, no noise at all, and as it has been summer it has been up and down a lot of times. I should look to see exactly what it is they changed. I just had to be sure that all surfaces that the strap is in contact with were sufficiently covered to prevent any contact with the plastic. Other than that and how always it's the case, a pain to discover but simple to remedy. OMG. This is by FAR the best thread I've read. For 2 years now i've had this very exact cracking noise and nobody (dealers) knew where it came from. It just tried your fix and it took all of 5 minutes and 2 bucks. Sound is now GONE.